This Cilantro Lime Chicken Taco Salad is flavor/texture heaven! This Cilantro Lime Chicken Taco Salad is bursting with tender, juicy chicken, all your favorite fiestalicious salad fixings including crunchy, salty tortilla chips and the zesty, sweet and the tangy Creamy Baja Catalina Dressing is out of this world delicious! You won’t be able to stop munching this Cilantro Lime Chicken Taco Salad! Grease and preheat the grill to medium heat, 375-450°F. Drain chicken from marinade, pat off excess and add to grill. Grill chicken undisturbed for 5-7 minutes per side, or until chicken is cooked through. (An inserted thermometer should read 165 degrees F.
Remove chicken to cutting board and baste with reserved 2 tablespoons marinade. Garnish with additional lime juice to taste if desired. Let rest 5 minutes before slicing. Reserve 1 tablespoon marinade for dressing. Slice or chop cooked chicken. Meanwhile, whisk together all of the Dressing ingredients in a medium bowl, including the 1 tablespoon reserved Cilantro Lime Marinade. Store in the refrigerator. Best if chilled at least 30 minutes. May keep in an airtight container up to 7 days. To assemble, add the Salad Ingredients to a large bowl and toss to combine. 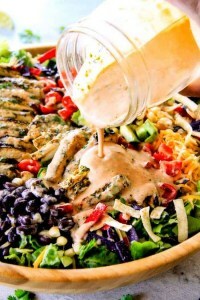 Drizzle individual servings with desired amount of dressing. Season with additional salt, pepper, hot sauce and/or lime juice to taste.